After Rita’s Light and Lively Waldorf I wanted to follow with another light and fresh recipe. Luckily it was easy because I’ve had amazing melons and cucumbers in my CSA box, and this melon-cucumber salsa sprang to mind. My selection of melons has included orange honeydew, crenshaw either white or pale peach flesh depending on the hybrid, and Charlyn, another variety similar to canteloupe. The orange is pretty with cucumber, but you can use green honeydew or white flesh crenshaw too. I served the salsa with jerk-seasoned grilled shrimp at a casual gathering of fellow food professionals. I hope you like it as much they did! Combine all ingredients for salsa and stir well. Sprinkle shrimp with jerk seasoning; drizzle with olive oil and mix gently. Cook in a non-stick skillet over medium-high heat, just until cooked through. 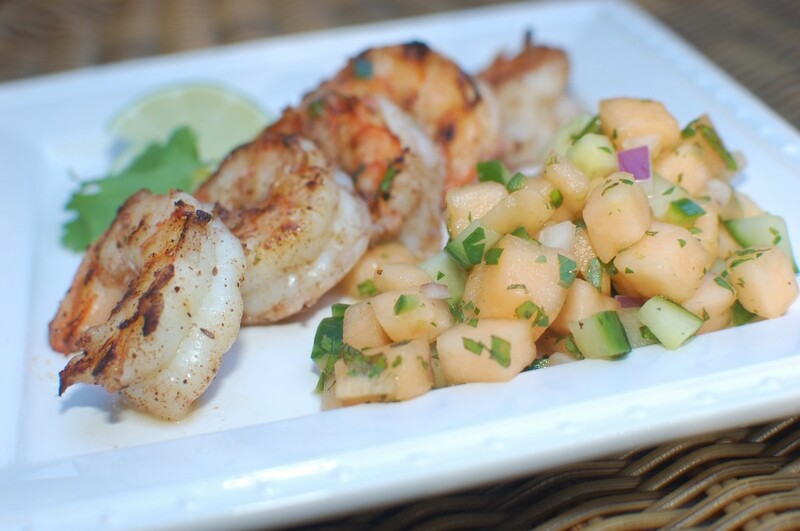 Serve warm or room temperature with melon-cucumber salsa. * Always wear food gloves when working with chiles. Slice half lengthwise; scrape out seeds with knife or fingers. Chiles can vary in heat level, so proceed with caution! * To make your own Jerk Seasoning combine: 1 tbsp brown sugar, 2 teaspoons allspice, 1 teaspoon cinnamon, 1/2 teaspoon each crushed thyme, ginger, nutmeg, garlic powder, black pepper and salt. Mix well. Makes 1/4 cup. Reserve leftover for seasoning chicken or pork. Hey there— if you noticed in this post notification I called for ‘peeled and deveined serrano chile’, I meant ‘seeded’ !! Would be impossible to peel that chile! This looks wonderful! I will make this next week! LOVE IT! Thanks for the idea , ladies! Val – be careful with the chile! Some are hotter than others, so start with a scant 1 teaspoon. I was one of the lucky people to try this at a recent pot-luck – it’s really great!! I have a mango I was thinking I might use in it, but I might have a cantaloupe in some dark corner in my refrigerator…. :-) Thanks for posting this! I just got back from WF and am making it now!